Effective strategy formula­tion concentrates actions and resources on critical issues, gains commitment, provides a rationale for allocation of resources, enhances communication, and increases your chances of thriving in your industry. However, leaders often face a three-fold problem relative to strategy: they confuse strategy with tactics; they don’t hire enough strategic thinkers who can handle the situational and episodic nature of strategy; and they make strategy an annual event, not an ongoing process. Strategy is “what” you are trying to do, not “how” you’ll do it. It involves setting the destination for the organization, not planning the way to get there. Both strategy and execution are important, but too many organizations mistakenly concentrate on the tactics before they have a clear strategy. Strategy comes first, tactics second. Each quadrant represents desirable or undesirable ways for companies to operate. The Competitive Advantage quadrant represents an organization that has established a strong strategy and the clear tactics to support it. This company has identified those decisions that have led to success in the past and that promise success in the future. This organization has acknowledged what it must do to beat the compe­tition and has identified ways to implement this strategy. Organizations operating in the Instant Gratification quadrant often succeed in the short term, but despite current profitability, they lack a strong strategy. They engage in effective operations that have accounted for their success in the past, but success is doubt­ful in the future. The Future at the Expense of Today quadrant depicts a company that has invested the time and energy to write and develop a strong, clear strategy. However, they have failed to formu­late the ways they will execute, which occurs when leaders no accountability for each initiative. Laurel Resting organizations struggle tremendously. At one time they may have had some clear direction, perhaps some strong leadership and committed employees who developed the pro­cesses and systems for driving the business, but these best practices have eroded. 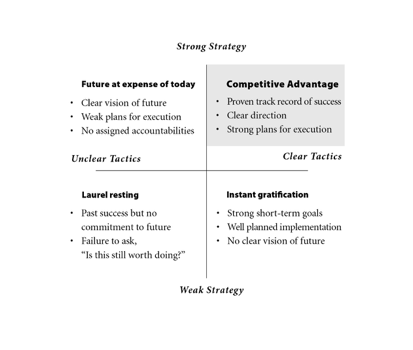 If your organization operates in a quadrant other than the Competitive Advantage one, you must first rid yourself of the strategies and tactics that no longer produce results, to begin sloughing off the decisions of yesterday in order to make the pivotal ones for tomorrow. Try asking the critical question: “If we did not already do this, based on what we know today, would we start do­ing it?” If the answer is “no,” stopping the initiative, curtailing it sharply, or limiting resource allocation to it can alert you to opportunities to respond to today’s demands and to commit today’s resources to the future. The key to a successful strategy is to make enough good decisions—not to avoid mistakes. Deciding what you will not do often becomes as important as deciding what you will do. Sometimes this means a change in strategy; often it requires a change in tactics; and occasionally, it even demands an entirely different strategy, because, in fact, there may not always be a market for the world’s best horse-drawn buggy or even an effective buggy-whip.